The regeneration of dermis and epidermis in the soft tissue is still challenging in an infected dermal wound healing. The protein-based biomaterial scaffold acts as a template for an extracellular matrix in the skin. Collagen biomaterials enhance healing of well infected and collagen fibres maturation by providing a scaffold for the more rapid transition to mature and aligned collagen fibres production at the wound site. Gelatin, denatured collagen bears no antigenicity and immunogenicity and can be easily exploited for controlled antimicrobial drug release owing to its degradation by bacterial gelatinase and collagenase present in the infected wound. A porous collagen scaffold impregnated with ciprofloxacin loaded gelatin microspheres, capable of delivering the drug in initially burst release followed by a controlled manner at the wound site has been developed. Ciprofloxacin loaded gelatin microspheres were prepared by water-in-oil emulsion technique and subsequently impregnated in a collagen scaffold. Collagen scaffold contained pores in the size range of 500-700µm that encapsulate gelatin microspheres. The degradation of gelatin microspheres at the wound site offers drug release at wound surface and collagen scaffold acts as a reservoir for gelatin microspheres and supports skin regeneration. Morphological features of microspheres and microsphere impregnated collagen were analyzed through scanning electron microscopy (SEM). The SEM micrograph reveals the presence of interconnectivity pores in the scaffold and heterogenous cross-sectional structures promoting cell fate process at the site of injury. The encapsulation efficiency of the drug in gelatin microspheres is 78.6%. Drug release profile shows that 27% of drug burst released within 5hours followed by controlled release up to 2 days. In vivo studies confirm gelatin microspheres impregnated in collagen scaffold heals full thickness wound created in Albino Wister rats in 12 days whereas antibiotic incorporated collagen sponge and plain collagen scaffold heal full-thickness wounds in 16 and 20 days respectively. Histological investigation on granulated tissue concludes microspheres incorporated collagen scaffold regenerated the dermis and the epidermis effectively and controls the infection at wound site by observing fewer neutrophils in the 4th and 8th day of wound healing. Masson’s Trichrome staining reveals the formation of well-stretched collagen bundles in the granulated tissue from treated groups and additionally, the aldehyde content in the collagen of treated groups increased with the days of wound healing confirming the formation of good crosslinking in the newly synthesized collagen in the regenerated wound. 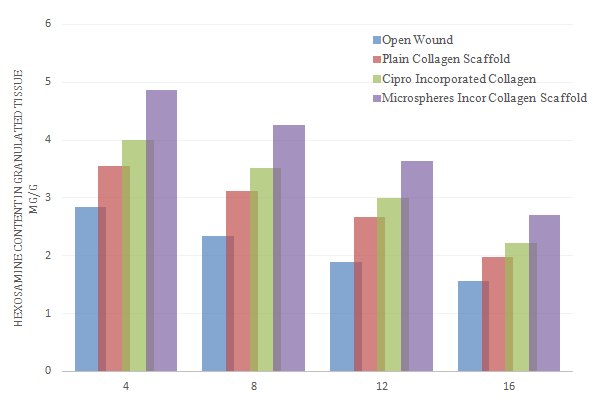 The biochemical analysis of granulated tissue from both open and treated wound confirms the microspheres collagen scaffold highly synthesized extracellular components in the tissue; concluding microspheres impregnated collagen scaffold would be a synergistic function of regenerating the soft tissue and controlling the infection effectively, results as effective wound care system. The regeneration of injured soft tissue is still challenging. The wound pathogens at the wound site delays regeneration of dermis and epidermis produce high inflammation and cause degradation of extra cellular matrix at the wound site by its native enzymes such as microbial collagenase, elastase and another microbial protease. The most common pathogens infecting the dermal wounds are Staphylococcus aureus and Pseudomonas aeruginosa which produces microbial enzymes degrading the extracellular matrix at the wound site. The growth of microorganism at the site of injury and rate of wound regeneration is unbalanced causing the delay in wound regeneration. The antimicrobial agent impregnated in the scaffold is required to combat the growth of infection at the wound site and promote the wound repair process. The scaffolds made from protein based biomaterials acts as a template for dermal regeneration and mimics extracellular matrix at the damaged site. Collagen is the most abundant protein in the connective tissue such as cartilage, tendon, and ligament and surrounds the cells and forms the 3D cellular matrix of all tissue, giving each its characteristic structure, texture and shape.1,2 Normally Collagen based biomaterials are used as wound dressings for dermal regeneration.Since collagen itself, a protein in nature and not used in highly infected wounds, wound pathogens degrade these collagens and use this as substrates for their growth. The antimicrobial agents incorporated in collagen biomaterials help to stabilize the collagen biomaterial and also to decrease the infection in the wound. The sustained release of antimicrobial agents at the wound surface provides a prolonged antimicrobial activity to eradicate pathogens rapidly.3 A possible method to deliver the drug in a controlled manner is by entrapping it in the polymer matrix. Among the protein-based polymers, Gelatin is a protein material and produced by the denaturation of Type 1 Collagen and supports cell fate process and suitable for preparation of biodegradable microspheres which effectively encapsulates drug. Gelatin and collagen are very susceptible by enzymatic cleavage both microbial and mammalian cells and its degradation products excreted in the metabolic pathway. Due to its good biocompatibility and prolonged usage in drug delivery vehicles and tissue engineering scaffolds, its choice is right for this objective to construct an effective wound care system for infected dermal wound and regenerate the dermis and epidermis quickly Figure 1. Recently, an approach to developing a smart controlled release scaffold by incorporating drug-loaded microspheres into the scaffold via casting and followed by freeze drying. The effort is to prepare the efficient and sustained/controlled delivery of antimicrobial agents at the wound site for combating the microbial growth and promoting tissue remodelling and regeneration. Ciprofloxacin (1-cyclopropyl-6-fluoro-1, 4-dihydro-4-oxo-7- (1-piperazinyl)-3-quinoline carboxylic acid) was chosen as a model drug due to its broad-spectrum activity due to the presence of reactive amine and carboxylic acid as functional groups, it has good penetration in both hard and soft tissues and treatment of infections in bones and muscles and also has the advantages of antimicrobial activity against beta-lactam resistant organisms. Hence this work describes the development and characterization of a reconstituted collagen scaffold impregnated with Ciprofloxacin loaded gelatin microspheres, capable of delivering ciprofloxacin in a controlled manner. This would be a probable solution to effectively manage wound infection, with the active participation of wound dressing in the healing process, and lessen the frequency of routine dressing change. The Type 1 collagen was extracted from bovine tendons according to protocol developed by Central Leather Research Institute, Chennai.3 In brief, the bovine tendons were collected from local slaughter house, Chennai and washed thoroughly with distilled water to remove residual blood. The minced tissues were washed using a nonionic surfactant. The washed tissues were suspended in 2% sodium peroxide solution for swelling and then washed with distilled water. The coagulated collagen was then suspended in phosphate buffer solution of pH 8.5 and treated overnight with trypsin (0.5%w/w). The tissue was again washed in distilled water to remove the enzyme and dissolved salts. The coagulated tissue was swollen again in distilled water after adjusting the pH of water to 2.5 with HCl, and treated with pepsin (0.3%w/w), overnight. After the pepsin treatment, tissues were washed repeatedly in water to remove the enzyme. The coagulated collagen was dissolved in Millipore water acidified to pH 3.5using HCl to get pure collagen solution. The undissolved proteins were removed by centrifugation at 10,000rpm for 30min. All the above operations were performed at a temperature of 15±2°C. The purity of collagen was checked by physicochemical characterization. 1% collagen solution was prepared in acidified water using acetic acid. To this, 400μl of Triton X-100 non-ionic surfactant was added and agitated for a few minutes to attain homogeneity. It was poured into a trough and allowed to dry in the air in a dust free chamber and also incorporated with drug/ any bioactive molecules. After getting homogenized collagen preparation, a known amount of ciprofloxacin (0.5mg) was added and stirred well and poured in the trough. Since the minimum inhibitory concentration of ciprofloxacin against S. aureus ATCC 29213 is 0.12–0.5 (μg/mL) and P. aeruginosa ATCC 27853 is 0.25–1.0 (μg/mL), the amount of drug to be added in the collagen scaffold is 10 times of MIC value of drug per cm2 of the scaffold. The thickness of prepared collagen scaffold is 2mm. The scanning electron microscopy (SEM analysis of Gelatin microspheres, Gelatin microspheres incorporated collagen scaffold and plain collagen scaffold were done. The cross-section of collagen scaffold is performed with scanning electron microscopy to reveal its cross-sectional topography and morphology. In-vitro release of ciprofloxacin incorporated gelatin microspheres in collagen sponge was carried out at 37°C in PBS (50ml) pH 7.4. The amount of ciprofloxacin released was measured at 278nm using a shimadzu UV- 2100S spectrophotometer. Male Wister albino rats weighing 150 to 200g were used for the present study. The animals were fed with commercial pellet diet (Hindustan Lever, Bangalore, India) and had free access to water. The animal experiment was performed according to the Institute’s ethical committee approval and guidelines. The wound creation was done,7 and the experimental rats were dressed with formulated dressing, plain collagen scaffold and collagen scaffold with antibiotic while the Control group was dressed only with gauss dressing. All rats were given regular changes on every day while the formulated dressing and the antibiotic dressing were changed once in two days. The healing pattern of the soft tissue regeneration in the albino Wister rats are evaluated by histological studies of granulated tissue collated from the wounds of rats both control and treated groups. Granulated tissues were collected at every 4 days intervals and transferred to 10% neutral buffered formalin (NBF) for 24hours at 4°C. The formalin fixed tissues were dehydrated through grades of alcohol and cleared in xylene and then embedded in paraffin wax (58-60°C melting points). The molds were labeled and stored until use. A 5-7µm section were deparaffinized and stained with hematoxylin following counterstained with eosine and Masson’s Trichrome Staining for collagen synthesis and collagen fibre morphology and its orientation in the granulation tissue. Neutrophils are good marker for monitoring the level of infection in the wound surface and these cells are an important function of immune cells against infections in the wound surface. It defenses against wound pathogens. More neutrophils on wound surface confirms more infected of wound. Based on the count of neutrophils, it can conclude the scaffold and how it does control the infections in wound site. Granulated tissues were collected on the 4th, 8th, 12th and 16th days for the estimation of different types of collagen in the granulated tissue. The pepsin soluble collagen was prepared from wound tissue as described by Miller and Rhodes et al. The 1(III) chains were resolved from the 1(I) chains on a 8% separating gel with 5% stacking gel by interrupted electrophoreses with delayed reduction of the disulfide bonds type (III) collagen. About 5mg of granulated tissue after removal of fat and grease from this tissue via solvent treatment was used to estimate the amount of collagen and hexosamine and uronic acid in this granulated tissue. All results have been expressed as mean and S.D and the results were compared statistically by student’s independent t- test using SPPS software (student version 7.01). The p value &lt; 0.05 was considered statistically significant. 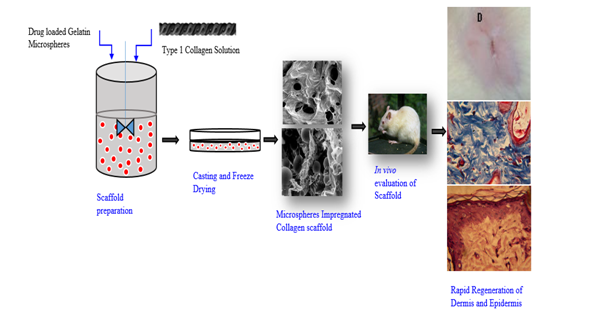 The extracted Type 1 collagen from Bovine tendons was proved mild antigenic, tissue biocompatibility and suitable for developing scaffolds for tissue engineering application.8‒10 The prepared porous collagen scaffold support cell fate process and increase the surface area of biomaterial which helps to increase the cell and matrix interaction. Past decade, Collagen based biomaterials used for soft tissue regeneration. Antimicrobial agents must incorporate with collagen biomaterials for infected dermal wounds. Because collagen itself protein, wound pathogens utilize collagen as substrate for their growth and may cause biofilm formation at wound site. Gelatin microspheres are used as a drug carrier. Gelatin also has the support for tissue regeneration and has capacity of drug entrapment. 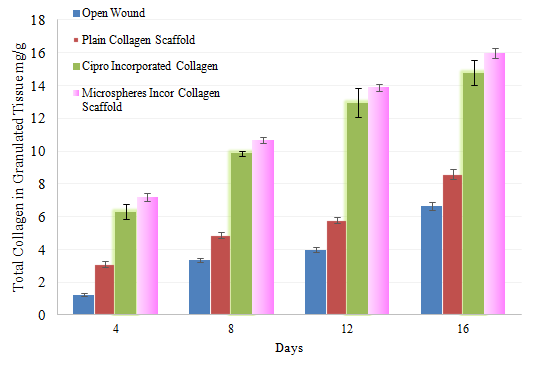 The combination of collagen and gelatin scaffold may influence better dermal regeneration at the injury site. Figure 2A the size and shape of ciprofloxacin loaded gelatin microspheres were further studied by SEM .The size of prepared Gelatin microspheres is varied from 1000nm -10μm. As shown in Figure 2B, the formulated microspheres were spherical and compact in nature. The particles were less aggregated and they were readily dispersed in water. The percentage of yield of drug loaded gelatin microspheres by water-oil emulsion technique is 88.2% during preparation and recovery and 78.6% drug encapsulated in microspheres. Figure 2C shows the surface morphology of micro sphere impregnated collagen scaffold, were collagen scaffold contains pores that entrap physically gelatin micro spheres. The SEM observation shows that the pore size of the plain porous collagen scaffold varies from 500 -600μm.11 The pore size of scaffold physically encapsulate gelatin microspheres effectively. The SEM observation shows the microspheres well distributed inside the pores of collagen scaffolds. Figure 2 Scanning Electron Microscopic Studies (A) Plain Collagen Scaffold. (B) Drug loaded Gelatin Microspheres. (C) Gelatin Microspheres impregnated collagen scaffold. Gelatin microspheres are known to swell in aqueous environments due to hydration and Gelatin microspheres degraded by the presence of microbial enzymes secreted by wound pathogens and Matrix metallo proteinase involved in tissue remodeling. Drug release profile shows that 27% of drug burst released within 5hours followed by controlled release up to 2days. Figure 3 The burst release of ciprofloxacin into the wound site immediately controls the eradication of microbial pathogens at the site of injury and sustained release of the drug combat the further growth of microorganisms, resulting the infection load and activated the wound repair process. Figure 3 Cross-sectional view of a plain collagen scaffold. An ideal drug delivery system is one that delivers sufficient quantity of drug at the site of action and prevents further bacterial proliferation. The activity of the released drug from the sponge shows a clear zone of inhibition controlling the growth of both culture inoculated with two different cultures. Drug incorporated collagen scaffold showed a bacterial free zone of 38±2mm around the Gelatin microspheres incorporated collagen scaffold against Staphylococcus and Pseudomonas. The initial burst release and the sustained release of GMC dressing is responsible for effective antimicrobial activity on the infected wounds. The porous nature of collagen scaffold is efficiently large to absorb and deliver drug and the presence of gelatin microspheres which absorbs water and maintains moist surface at wound and allows cellular process for repairing of wounds. However, the moist surface of the wound promotes the growth of microorganism when the wound surface contacts with surroundings. Wound contraction is mediated by specialized fibroblasts (my fibroblasts) found within granulation tissue. These cells are known to contract collagen gel, which were newly synthesized in the site of healing. After tissue injury, revascularization of the wound bed and redevelopment of the extra-cellular matrix is achieved through cell proliferation and the production of granulation tissue. Wound contraction is also an element of the proliferative phase of wound healing, which occurs through the centripetal movement of the tissues surrounding the wound. 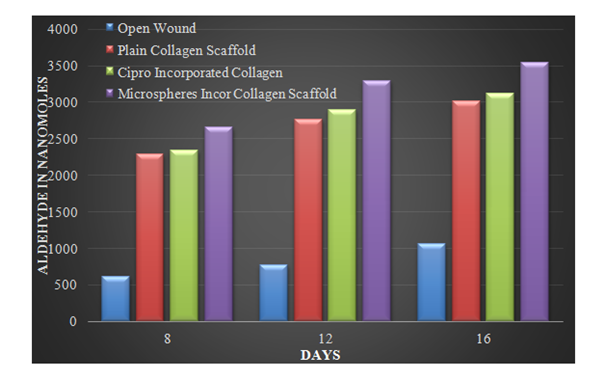 Figure 4 and Figure 5 shows increased wound contraction in GMC (Gelatin Microspheres impregnated collagen scaffold) group due to the enhanced activity of fibroblasts. The slow rate of wound contraction in rats with collagen scaffold and open wound may be attributed to the presence of microorganisms and their metabolites, which affects and inhibits wound contraction and impairs healing. In GMC group, the faster healing rate could be due to the constant and slow release of antibiotic from the dressing. Further the presence of gelatin also plays an important role in dermal regeneration. 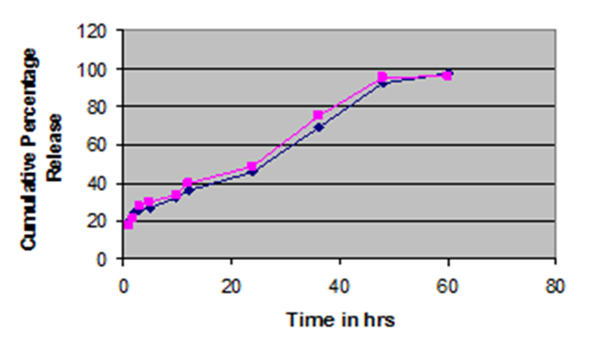 Figure 4 Release profile of ciprofloxacin from microspheres impregnated collagen scaffold. 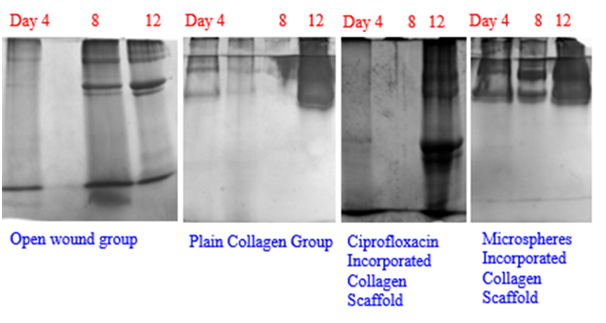 Figure 5 Wound contractions at 12th Day (A)-Open wound, (B)-Plain collagen scaffold, (C)-Antibiotic Incorporated Collagen scaffold, (D)–Drug-loaded Gelatin microspheres impregnated collagen scaffold. Figure 3 reveals the cross-sectional observation of the porous collagen scaffold used for the fabrication of a wound care system. The complex architecture of the collagen scaffold confirms the suitability of developing tissue engineering scaffolds for wound repair. The 3-dimensional porous scaffolds support angiogenesis and vascularization. Type 1 collagen is a predominant component of the extracellular matrix and this protein plays in cell fate process such as cell growth and differentiation and modelling the extracellular matrix. The complex architecture and interconnectivity pore with heterogeneity allows more interaction of cells with scaffold resulting faster regeneration of dermis and epidermis at the wound site. 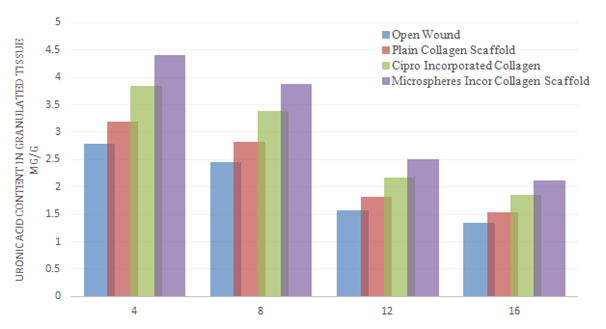 Figure 6 confirms the healing patterns of wound repair by the collagen scaffold and gelatin microspheres incorporated collagen scaffolds. In the case of Cipro incorporated collagen scaffold and gelatin microspheres incorporated collagen scaffolds, the regeneration of dermis and epidermis were observed and followed by the 12th day and 16th day, the complete formation of dermis and epidermis were over served. In these same groups, the neutrophils on the granulated tissue taken from 4th day and 8th day were minimal and forming epithelization, confirming a start of a programmed sequence of wound repair. Figure 6 evaluating of wound repair via histological analysis of granulated tissue. Figure 7 reveals the collagen synthesis in the granulated tissue from the open wound and treated group via Masson’s trichrome staining. In the case of Cipro incorporated collagen scaffold and gelatin microspheres incorporated collagen scaffolds, the regeneration of dermis and epidermis were observed with well-formed collagen synthesis and followed by the 12th day and 16th day, the complete formation of dermis and epidermis were observed and well-stretched collagen bundles formed in the dermis region path. In these same groups, the neutrophils on the granulated tissue taken from 4th day and 8th day were minimal and forming epithelization, confirming a start of a programmed sequence of wound repair. Figure 7 Masson’s Trichrome staining of granulated tissue (bluish violet colour indicates the collagen bundles in the tissue). Figure 8 reveals the type 1 collagen content increased in a treated group especially in ciprofloxacin incorporated collagen scaffold and microspheres incorporated collagen scaffold. Figure 8 SDS -PAGE of Type 1 Collagen in the granulated tissue. Figure 9 reveals the increase of the total collagen content in the granulated tissue and high content of collagen in the granulated tissue taken from a treated group such as drug incorporated collagen scaffold and microspheres incorporate collagen scaffold. Figure 9 Total collagen content in the granulated tissue. Figure 10 confirms the crosslinking of the collagen in the granulated tissue. The amount of aldehyde increased in the granulated tissue taken from the Cipro incorporated collagen scaffold and microspheres incorporated collagen scaffold confirming the formation of well stretched and crosslinked collagen in the tissue. Figure 10 Total aldehyde content in the granulated tissue. Figure 11 and Figure 12 confirms the good regeneration of the dermis and epidermis by decreased the synthesis of ground substrate molecules in the extracellular matrix. Figure 11 Hexosamine in the granulated tissue. Figure 12 Uronic Acid in granulated tissue. 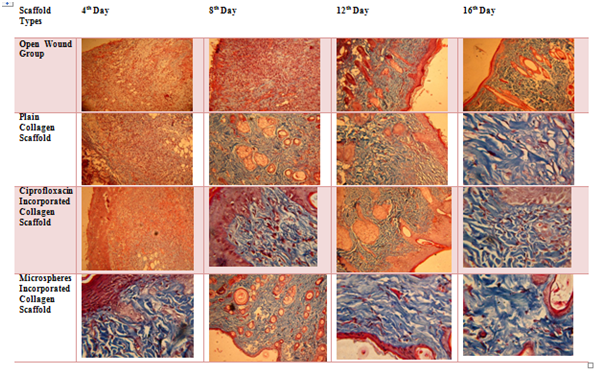 Figure 13 and Figure 14 confirms the neutrophils decreased in the treated group by reducing the wound pathogens and combating its growth via sustained release of ciprofloxacin from the collagen scaffold and gelatin microspheres. As a result, the regeneration of dermis and epidermis in the granulated tissue of wound surface were observed. Figure 13 Neutrophils in the 4th day of Granulated Tissue. Figure 14 Neutrophils in the 8th day of Granulated tissue. In summary, currently developed microspheres impregnated collagen scaffold had been designed to deliver drug over the wound surface in a uniform and sustained fashion. The biomaterials used to develop this system are of natural origin, which minimizes possible toxicity due to the core materials used. Apart from that, collagen and gelatin by virtue possess active wound healing property. Collagen scaffold used as delivery device adds up more advantage to the present system since it minimizes dressing frequency makes examination easier and assessment of wound site with added aesthetic value. Zbigniew Ruszczak. 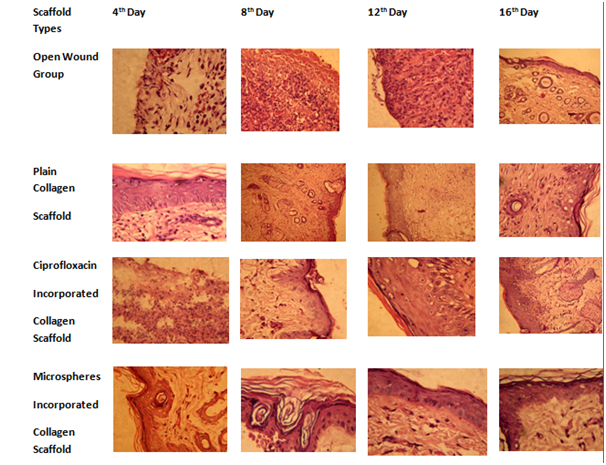 Effect of collagen matrices on dermal wound healing. Advanced Drug Delivery Reviews. 2003;55(12):1595‒1611. Stephen FB. The extracellular matrix as a biologic scaffold material. Biomaterials. 2007;28:3587‒3593. Sripriya R, Kumar MS, Ahmed MR. Collagen bilayer dressing with ciprofloxacin, an effective system for infected wound healing. J Biomater Sci Polym Ed. 2007;18(3):335‒351. Loke WK, Lau SK, Yong LL, et al. Wound dressing with sustained anti-microbial capability. J Biomed Mater Res. 2004;53:8‒17. Saravanan M. ultrasonically controlled release and targeted delivery of diclofenac sodium via gelatin magnetic microspheres. International Journal of Pharmaceutics. 2004;283:71–82. Shanmugasundaram N, Sundaraseelan J, Uma S, et al. Design and delivery of silver sulfadiazine from alginate microspheres‐impregnated collagen scaffold. J Biomed Mater Res Part B: Appl Biomater. 2006;77;378‒388. Sripriya R, Kumar MS, Sehgal PK. Improved collagen bilayer dressing for the controlled release of drugs. J Biomed Mater Res B Appl Biomater. 2004;15;70(2)389‒396. Chi HL. Biomedical applications of collagen. Int Journal of Pharm. 2001;221:1‒22. James MP. Collagen‐based devices for soft tissue repair. J Biomed Mater Res Part B: Appl Biomaterials. 1996;33:35‒40. 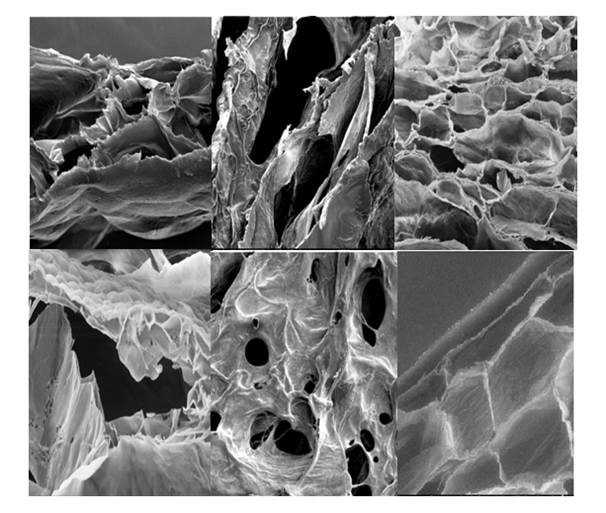 Miyata T, Taira T, Noishiki Y. Collagen engineering for biomaterial use. Clin Mater. 1992;9:139‒148. Subbiah R. Osteogenic/Angiogenic Dual Growth Factor Delivery Microcapsules for Regeneration of Vascularized Bone Tissue. Adv Healthcare Mater. 2015:4:1982–1992. ©2019 Shanmugam et al. This is an open access article distributed under the terms of the Creative Commons Attribution License , which permits unrestricted use, distribution, and build upon your work non-commercially.